With his book Nazism Changed My Life, Bjørn Bjarre creates a link between the artist’s life and world history, and exposes a connection between politics and the individual’s emotions, as well as pointing out that there are hidden connections between historical events and personal histories. Connections not created by any established roles, but through the information available to us. It is difficult not to take sides in conflict and war. One tends to identify with either the perpetrators or the victims. The middle position could be that of a witness, but it might only be a possible position for the outsider. To those of us born after World War II, there is an implied responsibility to identify with both sides of this devastating historic event. But sixty years down the line it is impossible to take the position of that of a witness. 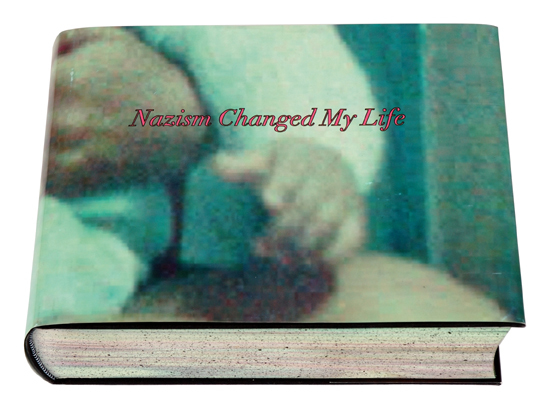 Through Nazism Changed My Life, other alternative roles are investigated.